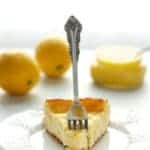 This Lemon Cheesecake if full of delicious lemon flavor! It is an easy cheesecake to make, with some homemade lemon curd, but one that you will want to make again and again. Crush the Lemon Oreos and mix with the melted butter. (I crushed mine using a food processor and just poured the melted butter in and mixed another minute or two until well combined). Press the Oreo-butter mixture into the bottom of a springform pan and set aside. With the paddle attachment on your mixer, mix the cream cheese, sugar, eggs, and vanilla on low speed for about five minutes. Pour half the batter into your spring form on top of the cookie crust and spread gently. Pour half of the lemon curd in large dollops on top of the first layer of cheese cake and swirl gently with a butter knife. Repeat with the remaining cheesecake batter and then lemon curd. Bake for 40 to 45 minutes, until the top is slightly cracked and the edges are golden (mine took 43 minutes).